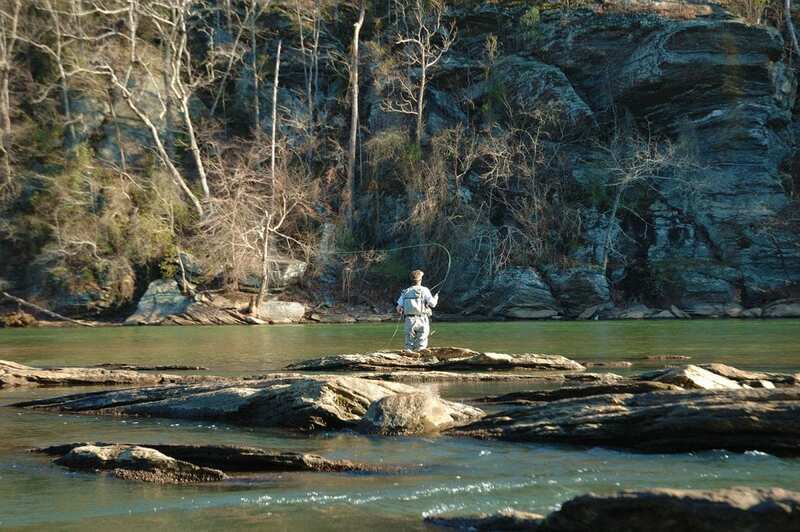 It’s a wonderful time of year to be a trout angler in the Southeast. Across the region, states have been stocking streams for the delayed trout harvest seasons. From now through the winter months into spring, these streams are catch-and-release only. High densities of trout that stay in these creeks and rivers during the cool season make for some of the fastest action of the year. The regulations and timing of the delayed trout harvest seasons vary slightly from state to state, but generally it’s single-hook, artificial only. Here’s a quick rundown of some of the best delayed harvest opportunities across the Southeast. Falling from high mountains at the Tennessee/North Carolina border, the Tellico is a beautiful freestone that holds both stocked trout and wild trout, thanks to a productive system of clean, high-elevation tributaries. The delayed harvest stretch is long, nearly 8 miles of river stretching from the North Carolina border downstream to the mouth of North River. It’s is in a relatively remote corner of Tennessee east of Tellico Plains, so fishing pressure is not as heavy as might be expected. The North Mills River, between Hendersonville and Asheville, fishes a lot like a high-mountain creek on its upper end. The difference is it’s loaded with fish that are bigger than the little rainbows you’d typically find in a wild stream. The creek sees a good deal of fishing pressure around the parking lot at the North Mills Recreation Area, but taking a little hike upstream will outdistance most of the casual anglers. Take your small rod, and enjoy making short casts to eager fish in small pools and pocket water. The entire state of South Carolina only has about 200 miles of trout water. So it might come as a surprise to some that there are good fisheries in the Upstate. Over in the mountains, near where the borders of North Carolina, South Carolina and Georgia meet, there are some very good trout streams. The Eastatoe is one of them. On the lower end, the Eastatoe is a decent-sized flow, shallow and broken by shoals, which makes for easy wading. There is also ample, relatively easy access to the river, and it is kept brimming with trout from the nearby Walhalla Fish Hatchery. Running through the northwest side of Atlanta, the 4-mile delayed harvest stretch of the Chattahoochee River is a large, shoal-broken escape from the city. It’s also a heck of a trout fishery. Easily accessible via river parks and a trail that runs the length of the delayed harvest stretch, it’s a good place to walk and wade. A short float trip in a small boat is a good way to access water that others can’t. It’s a big river with big blue winged olive hatches in the cooler months.